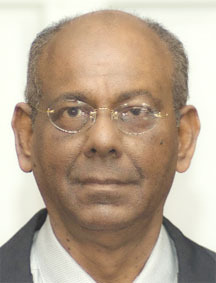 Former Speaker of the National Assembly, Ralph Ramkarran. [www.inewsguyana.com] – AFC Vice Chair, Moses Nagamootoo, announced that his party was contemplating a motion of no confidence against the Government. The complaint then was that the Minister of Finance violated the law when he spent some $4 billion that was not approved by the National Assembly during the debate of the Estimates. Since then a list of demands has been made. APNU, whose support is necessary fo the success of such a motion, later said that it would be discussing the matter and may support it. The Government considered the statement to be a threat. One headline screamed “DO IT.” Another thundered, “I AM A WARRIOR.” It is doubtful that the President would have been speaking about physical combat, sumo wrestling style, with Moses Nagamootoo. But with his recent display of physical fitness, one can never be sure, especially since Moses would be at a distinct disadvantage, not having pictorially demonstrated any accomplishments in physical attributes similar to those of the President! President Ramotar’s testy reaction is surprising in view of the fact that clear hints have already been broadly given by him that new elections are on the agenda for consideration. This is the reason that local government elections are not being held. Resolving the current political impasse by new elections or other means should be the concern of all political forces and all Guyanese. A suggestion of elections being a way forward, which is the constitutional right of both sides, should not be the occasion for the display of ‘bad man’ politics, which should now be discarded as a feature of Guyana’s politics. It ought to be an issue attracting careful consideration with the national interest being paramount. The current situation is characterized by the inability of the Government to persuade the Opposition to support any major project, most legislation or most budgets in their entirety. Clearly both the Government and Opposition might feel that such a situation cannot continue indefinitely and that it might be in the interests of the nation to call new elections. The fact that neither side has taken the necessary steps that would bring new elections, leads to the conclusion that neither is certain what the results would be. The national interest is one thing but partisan interest is a wholly different matter. The expressions of confidence by both sides at the potential outcome of new elections should be taken at face value and in the context of the need to keep supporters engaged. No political party will ever say that it will lose or not do better than the last time. But the fact that no one has belled the cat is evidence of the uncertainty they feel. The 2011 results is the first time in the history of free and fair elections that no party has obtained an absolute majority either of seats or votes. Thus no one can be sure that 2011 was a flash in the pan or a signal of what is to come. The ‘troubles’ started in 1962 over the economy. It was weak enough and poverty was sufficiently entrenched to be exploited to encourage violence. The PNC began to lose its hold on its own supporters during the second half of the 1970s when the bottom fell out of the economy, which continued a downward spiral. By the referendum of 1979 its supporters had stopped voting. The results of 2011 came at the end of about a decade of poor or no economic growth and anger among sugar workers. The beginning of the growth pattern of the economy before 2011 and subsequently, while being the best in the region, and receiving the kudos of experts, has not been significant enough to impact the population within the period of each election cycle. At this time the sugar industry continues to struggle while gold production appears to be falling. Actual production, which produces jobs and development, accounts for only part of the growth Guyana is experiencing. The state of the economy has always played a defining role in political developments. While PPP governments can boast of substantial progress in many areas, there is still a sufficiently large group of its supporters who have not been touched in any significant way by economic and other developments. These are the people who can cause the results of 2011 to be repeated because their situation has not changed since 2011. The Opposition’s supporters will not react against their parties because of the economy. But they may react at the impotence of the Opposition by a display of apathy on election day. The Government and Opposition have to consider that there is a chance that elections held now with the same political line up will yield the same or similar results. As against this they also have to consider that no economic or political progress is taking place in the country and the continuing stalemate is creating more disinterest among the entire electorate. Our political parties are therefore in a dilemma. There is the national interest and the partisan interest. They conflict with each other. The national interest suggests that a new mandate should be sought, which may break the deadlock, while the partisan interest suggests that they should stay put, which will continue the deadlock. Which one will pevail? RALPHIE BBHAI U WILL COME ACROSS AS TRAITOR JUST LIKE RAMJATAN AND NAGAMOOTTOO. WHY DO U NOT SIT BACK AND RELAX AND GET OUT OF POLITICS FOR ALL TIMES. BHAI YUH OLD NOW SO STAAN HOME WID YUH GRAND PIKENY DEM AND SHUT YUH MOUTH. DONT HELP PNC GET BACK IN POWER BECAUSE YOU DIDNT GET TO BE MAHARAJAH KING RULER.